The work was presented in February at the El Bolson International Clown Festival in the Argentine Province of Chubut. On Sunday, it will premiere in the capital city. In this monologue, the actor from Bilbao fuses the routine of a Basque waiter with Basajaun, one of the main Basque mythological characters. “Basajaun. Bestia. Bruto.” Will debut in Buenos Aires in the Pan y Arte Hall, with admission being a donation. Buenos Aires, Argentina. “In a small and isolated town, an experience Basque waiter is getting for another work day. Again, he will have to be in his place, but in the middle of his daily and solitary routine, an insistent discomfort howls at him. He will then have to keep his composure. 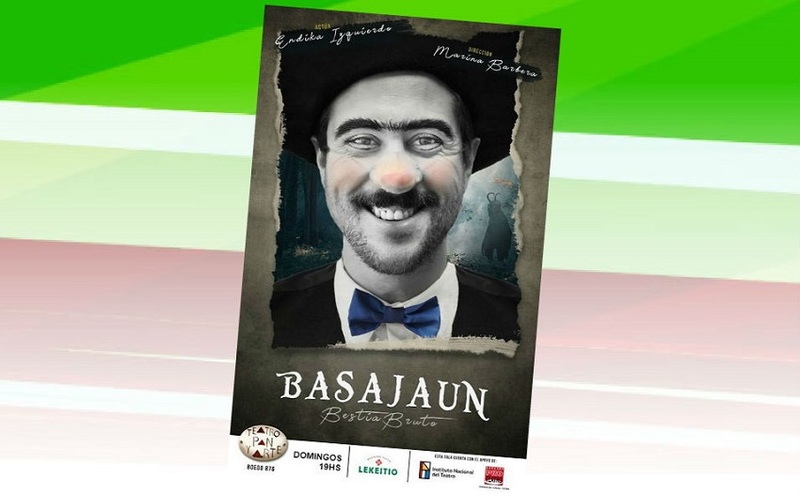 Or maybe not.” This paragraph is how Endika Izquierdo, one of the three authors of the work, describes “Basajaun,” this work that was part of the 2018 El Bolson International Clown Festival, can now be seen in Buenos Aires in April and May. Directed by Marina Barbera, the work not only references Basque them from the plot, but the title also enters into the dialogue with deep Euskal Herria because Basajaun is a prominent character in Basque mythology. Basajaun is the lord of the forest, “a mythological being who lives hidden from men in the depths of the mountains; an immense beast that is covered in long coats that appears scary, but far from being aggressive, he protects the flocks with his roar when wolves approach or when storms are approaching,” the authors explain. “Basajaun. Bestia. Bruto,” will debut in Buenos Aires this Sunday, April 15th, which is almost sold out, despite its almost two-month run. The performances will take place on Sundays at 7pm at the Pan y Arte Hall, located on Ave. Boedo 880, there will be a hat at the entrance. Reservations may be made here: Alternativa Teatral.